Hi friends, and happy National Watermelon Month! That’s right, July is National Watermelon Month, and I’m so excited to continue my partnership with The Watermelon Board this year to bring you more fun recipes and tips for using one of my favorite summer fruits – watermelon! 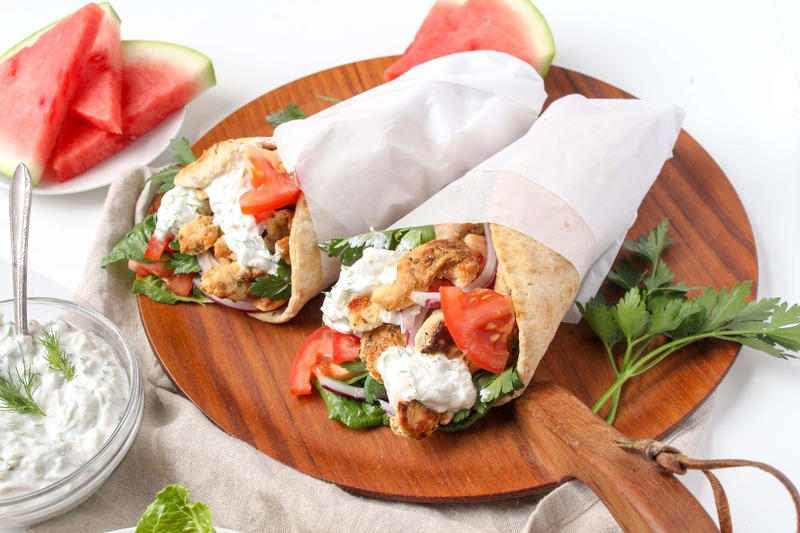 First up: these flavorful and summery Chicken Gyros with Watermelon Rind Tzatziki. Did you know that 100% of a watermelon is edible, including the rind? Using watermelon rind in recipes is not only tasty, but also a great way to reduce food waste. Give it a try if you haven’t already! 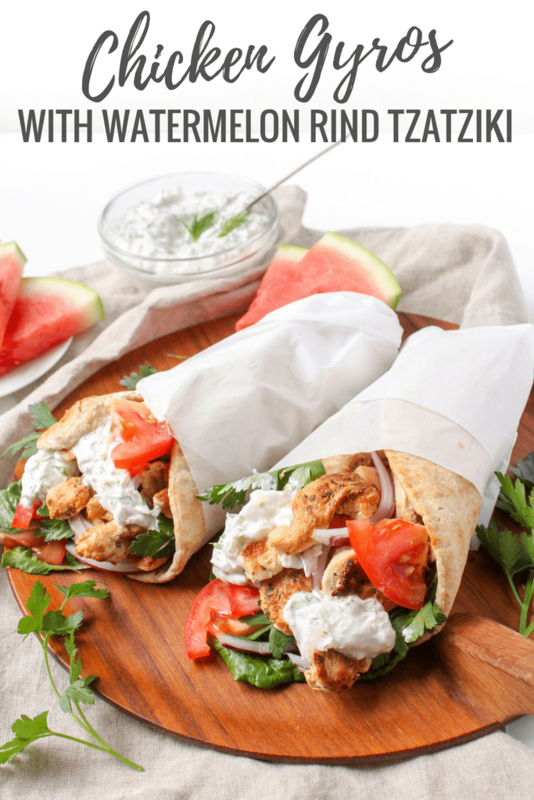 In addition to these delicious gyros featuring watermelon rind, you may also want to try my Watermelon Rind Coleslaw – it’s perfect for summery BBQs, either as a standalone side or as a sandwich or taco topper! Tzatziki is a yogurt sauce that traditionally uses grated cucumber and dill, but I swapped out the cucumber for grated watermelon rind. Watermelon rind actually has a similar texture to cucumbers (just a tiny bit firmer), and since both cucumbers and watermelon rind have a mild, fresh flavor, the swap works perfectly. Since you’re working with the whole watermelon for this recipe, be sure to wash it well first, and then separate the rind (white and green) from the flesh. Save the red “flesh” for snacking on later (or immediately…! ), and grate up the rind to go in the tzatziki with yogurt, lemon juice, garlic, and dill. 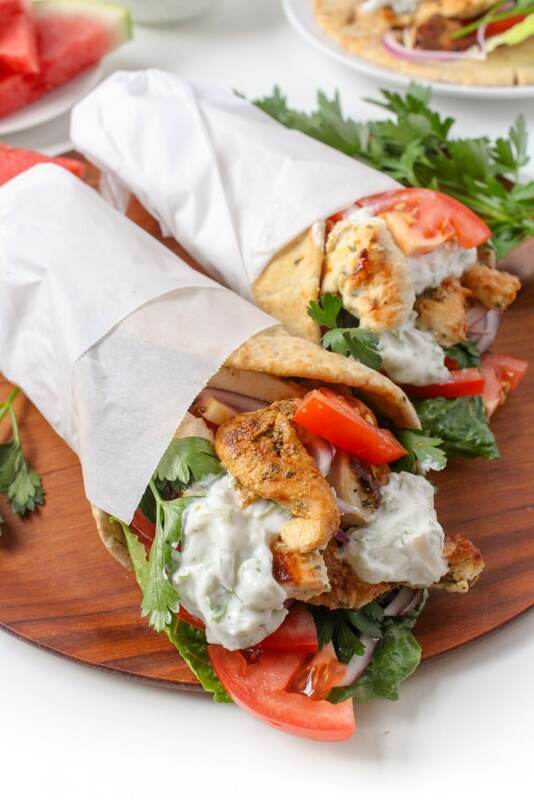 Another key component of these delicious gyros is the juicy marinated chicken. The marinade is so simple, but it adds an insane amount of flavor! 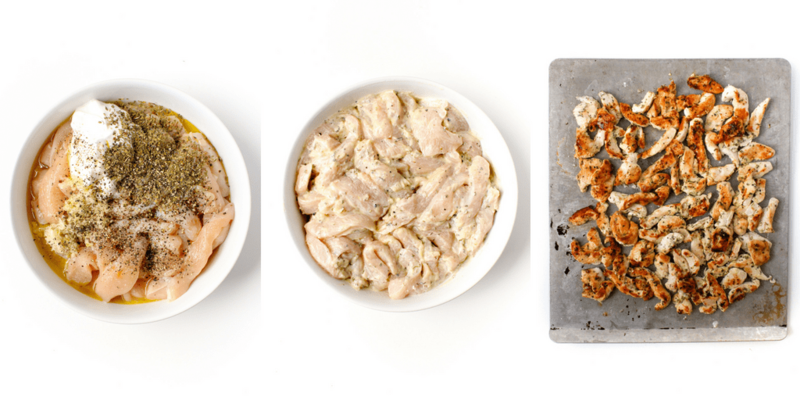 The combination of yogurt, lemon juice, olive oil, oregano, and garlic makes the chicken super moist and savory. If you’re in a pinch, you can also sub in leftover rotisserie chicken – just shred the chicken and toss it in a little lemon juice, grated garlic, and dried oregano while reheating. 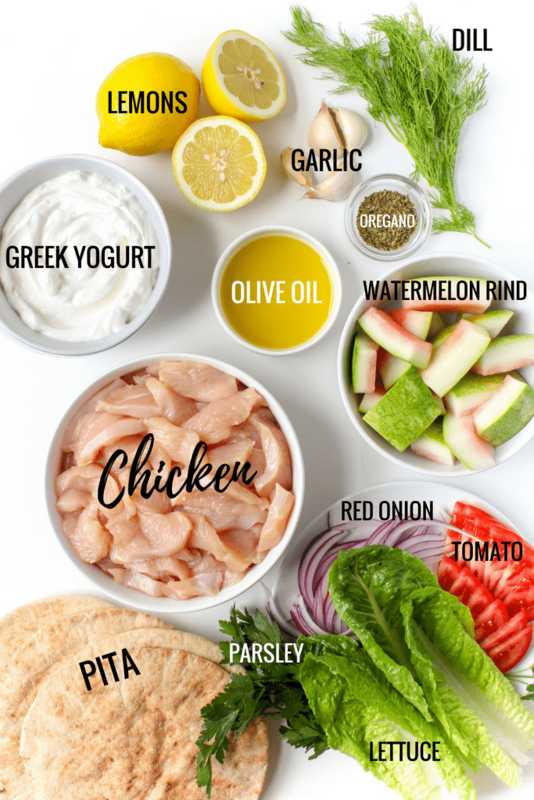 Once the tzatziki sauce is stirred up and the chicken is marinated and broiled, it’s time to build the wraps! I piled crunchy romaine lettuce and red onion, juicy tomatoes, and fresh parsley on whole wheat pita bread, but feel free to use whatever fresh veggies and herbs you have on hand. Place the chicken and all marinade ingredients in a large bowl. Toss to combine and coat the chicken pieces evenly. Let sit in fridge for at least 30 minutes, up to 2 hours. Meanwhile, make the tzatziki: Place the grated watermelon rind in a bowl lined with a paper towel. Squeeze as much liquid as you can out of the rind, then discard the liquid. 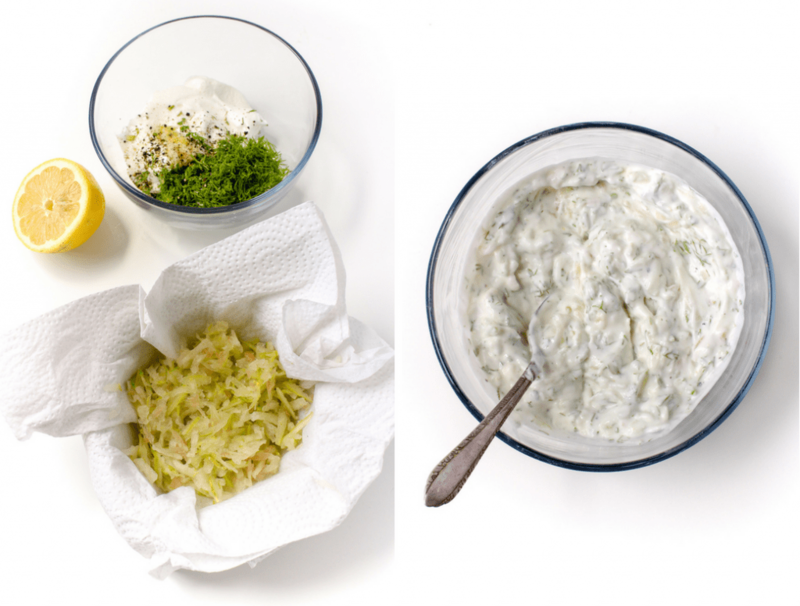 Place the rind in a bowl with the remaining tzatziki ingredients and stir to combine. Heat the broiler to high and remove chicken from the fridge. Spread the chicken on a greased baking sheet and pat with paper towels to remove much of the liquid from the marinade. Broil for 8-10 minutes, until the chicken is browned and cooked through. 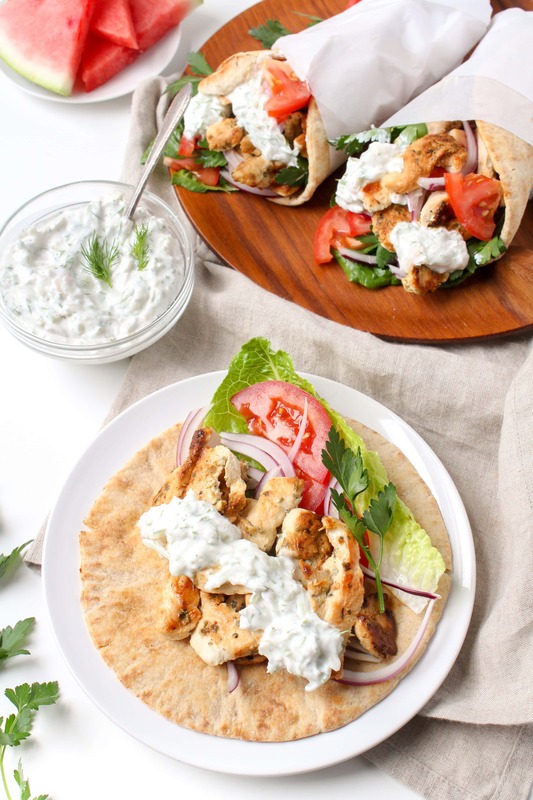 Assemble gyros by filling the pita or flatbread with lettuce, tomatoes, red onion, parsley, and chicken, then spooning the tzatziki over the top. Enjoy! Feeling inspired to try your hand at cooking with the whole watermelon, too? The Watermelon Board actually has a recipe contest going on right now; you can enter your original recipes using the whole watermelon for the chance to win $500! Plus, your recipe will be professional photographed and featured on Watermelon.org. Cool, huh? For more details and to enter, check out the Use the Whole Watermelon Recipe Contest page. You have until August 10 to enter! And for more tips on cooking with and using the whole watermelon, check out their Use the Whole Watermelon tips page. Wow, these look amazing! Maybe I’ll give them a try this weekend. Now that I’ve seen them, I’m craving a chicken gyro! YUMMY!!!! This sounds amazing! 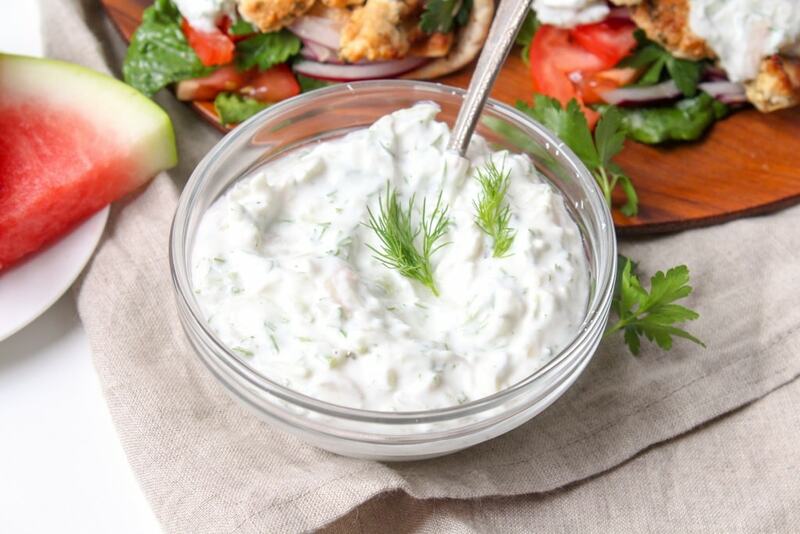 I love traditional tzatziki so I cannot wait to try this! Thanks for sharing! You are giving me sooo many great, healthy meal ideas! I love gyros, and those look terrific! Thanks! Oddly, I’ve never been a fan of any type of melon my whole life. However, I’m one to always keep trying, and I do love them in salads, smoothies, and recipes; just not out-of-hand! I love how this makes beautiful use of the rind. Such a unique and fun recipe! I thought of you the other day while at Trader Joe’s because I found they have a watermelon, cucumber, mint yogurt. I have it to try today! If you can find it, then I recommend you give it a try too since you love watermelon so much. :) Thank you for the recipe! That sounds delicious! :) I’ll look for it! Great flavor combo. Would you recommend using organic in order to use the rind? If possible, yes! Either way, scrub it well too.